The Global Sustainable Tourism Council (GSTC) Director for the Asia Pacific, Professor Mihee Kang and the GSTC trainer for Vanuatu Dr Cherise Addinsall has conducted a 3-day GSTC Sustainable Tourism Training Program and GSTC Independent Auditor Training with guest speakers Mr Fredrick Maclean (former General Manager of the Havannah Resort Vanuatu) and Ms Anjali Nelson from the Nakau Programme who is developing mechanisms for investments in Vanuatu’s conservation areas. The GSTC Sustainable Tourism Training commenced on the 29th Jan with the launching of the Vanuatu Sustainable Tourism Policy (2018-2030) with the support of the Director General Mr Roy Mickey Joy. The Vanuatu Sustainable Tourism Policy (VSTP) (2018-2030) includes ambitious but achievable objectives based on the GSTC Criteria for Sustainable Destinations. The VSTP is the first policy document in the South Pacific to incorporate GSTC Criteria for Sustainable |Destinations. 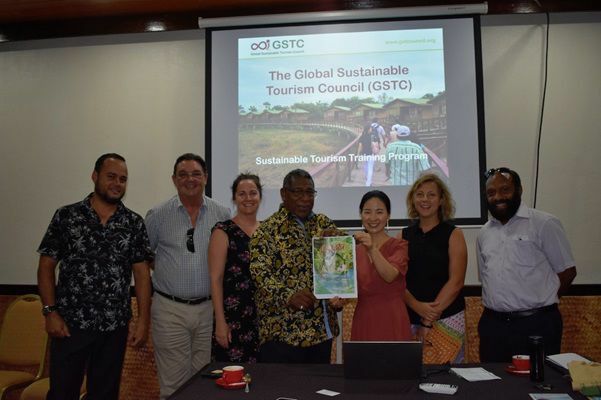 This collaboration with GSTC has enabled Vanuatu to be the first country in the South Pacific to receive GSTC Sustainable Tourism Training. The training was attended by over 50 stakeholders from Government and private sector. It was a collaborative process full of discussions about Vanuatu’s values, protection of traditional knowledge, creating a fair playing field in Vanuatu’s tourism industry for Ni-Vanuatu people, the impact of tourism on the traditional economy, and instilling Vanuatu values to guide how the tourism industry is developed. Paramount Chief Mr John Star from Dolav community expressed his concern with people performing custom practices in Efate that he is a custodian of without permission, while Sarah Tari from WEAV talked about traditional handicrafts being duplicated overseas and sold in Vanuatu to tourists. Mrs Leimalu-Ines Tapasei who was elected by the chiefs and community of Sunae Village, Moso Island for the past two years as the Chairlady for the Sunae Village Council on Moso and her partner Mr Willie Tapasei, highlighted the desire of the community to develop tourism yet on a low impact small scale, which lead to the discussion of sustainable carrying capacity levels for destinations such as Moso Island. With considerable growth targets being put forward for segments particularly cruise tourism there is an urgent need to determine sustainable carrying capacity levels for tourist arrivals to key destinations in Vanuatu. These are real concerns that thanks to the VSTP Vanuatu now has a policy framework to address these real issues to Vanuatu’s culture and people. While the VSTP was developed from proper wide consultation throughout the provinces over 12 months ago, attendees at the Sustainable Tourism Training questioned the holdup of the launching of the VSTP. Principle Accreditation Officer Jerry Spooner explained that due to the actions of a few in deliberately trying to block the launching of the VSTP for their own vested interests, this impacts on majority of stakeholders who seek to make Vanuatu’s tourism industry more sustainable. Mr Spooner explained the importance of VSTP in transforming Vanuatu’s tourism industry towards a long-term goal to be a sustainable and equitable one, supporting Ni Vanuatu values. Mr Spooner also acknowledged and thanked the New Zealand Government through the VSTAP (MFAT) program for their financial support towards the development of the VSTP and the GSTC Sustainable Tourism Training Program. Copies of the Vanuatu Sustainable Tourism Policy can be accessed through the Department of Tourism website.